Copyright material courtesy of The Pixelizers. Lead your beloved people to your PROMISED LAND! Open Sea! 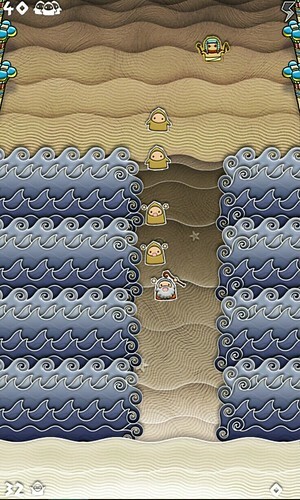 is a challenging Puzzle and Timing game wherein you play as a god helping your lowly followers lead by Mo. You have to part the sea in order for them to cross. You do this using your finger to swipe the sea and part it. You are also granted the ability to hurl lightning bolts to shock enemies threatening the lives of your beloved followers. It can also be used to make your elders move faster and wake up the sleepy ones. Your followers are chased by mummies and pharaohs and you, as their savior, have to do anything to protect them from these enemies. By anything, I mean drowning them, shocking them or removing the paths left behind by your followers. As you progress in the game, you get to meet people that would give power-ups when they successfully cross the sea. You'll meet a hero that lets your people walk on water, gives a free ride to his ark and many more. Also, you not only get power-ups but new followers you have to save. You'll meet the sleepy ones who keeps on sleeping in the middle of the sea and drunk people who drowns themselves to death. It's all up to you to discover more of them! The graphics of the app is also very good. It's cute and the developers surely did a lot of efforts producing such simple but fantastic graphics. The music also suits the theme of the game. Overall, the game is a must have if you want a fresh and uniquely themed game! It gets more challenging but more entertaining as you go through the game. A good app to kill some time when you are bored or just wanna have some fun.